Tochigi (栃木) is located south of Tochigi prefecture. It is also known as the Town of Kura. Kura is Edo style storage. There are lots of Kura which remaining from Edo period, and most of them are still used. 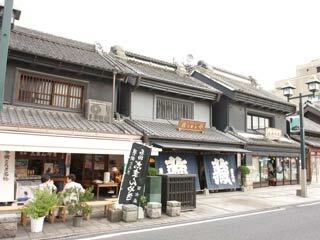 With those Kura Style buildings, Tochigi is called Little Edo. There is a parking which gives you a guide map of this city. Tochigi was used be a post station between Toshogu Shrine and Kyoto imperial court, Reiheishi, during Edo period. There are 21 post stations between Edo and Nikko, and Tochigi is one of them. Reiheishi carried special bill for Toshogu Festival. This tradition kept from 1646 to 1867. Because it was located far from Tokyo, most of historic site, such as temples and shrines, and all Kura Style building are survived from WWII and remains in original condition. About 2 million people travels Tochigi every year. Most of the Kura Style shops are located Kuranomachi Street. There are many local or memorial museums, and Samurai house.